The Great Tower of Bowser Land (known as The Great Tower of Bowser World in the British English version), also known as World Bowser -Castle is the final standard course of World Bowser, and the final main course in Super Mario 3D World. It is set in Bowser's Castle, now amusement-park themed, with a very tall tower on the center. Unlocking this level requires 170 Green Stars. The entrance from the world map. The course begins near the remains of the Bowser Mobile and right next to it a zipline. If the players have a cat suit, scratching the golden tire wheel will make the car light up and make a foghorn noise. Then after jumping onto the zipline and jumping off, the remainder of the course is on the roof. The course contains bottomless pits, Volcanic debris from the volcano in the background, along with Spikes in the floor. After passing that, the Crazy Clown Ferris Wheel, Captain Toad awaits the players before them get on another zipline that leads to Bowser. After that, Bowser appears and uses a Super Bell to turn himself into Meowser. The rest of the course involves climbing a large tower while Meowser shoots fireballs, scratches through the wall, and uses Double Cherries so his doubles can assist. At the end of the course, a large POW Block must be hit four times to defeat Meowser. A Clear Pipe to the Goal Pole reveals itself, and the course ends with all seven Sprixie Princesses rescued. During the credits, Mario, Luigi, Peach, and Toad return to the Mushroom Kingdom, as do Captain Toad and the other Toads. Bowser is trapped inside a bottle, Boom Boom is upset and Pom Pom tries to comfort him. The Sprixie Princesses, their people and Plessie also give their new friends a fond farewell. Additionally, Rosalina appears if the player replays the level after unlocking her. Green Star 1: After getting off of the first zipline, the Green Star is on the rightmost side of the highest part of the first building the player lands on. Green Star 2: On the Ferris Wheel, the four Bullies must be defeated to reveal the second Green Star. If the Bullies are all defeated, the Green Star will reveal in the center of the Ferris Wheel. Green Star 3: During the first phase of the final battle, revealed after collecting every Green Coin from the Green Star Ring. At the end of the stage, near the Goal Pole, there is a bell tree with the stamp floating directly above it. The stamp is Meowser. 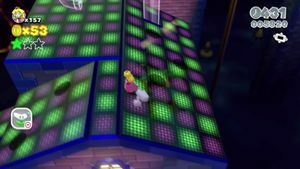 The music that plays during the battle with Meowser contains portions of the themes for the Battlerock Galaxy, Buoy Base Galaxy from Super Mario Galaxy and Space Storm Galaxy from Super Mario Galaxy 2. The music that plays during the second phase of the fight with Meowser on this level is available in Super Smash Bros. for Wii U as a track that can be heard on the Mario Galaxy stage. This page was last edited on April 9, 2019, at 13:22.